Eisteddfods are competitions where students can enter to perform a solo, duo/trio or as part of a group/troupe in the styles of classical ballet, jazz, tap, song & dance, contemporary and many more. Eisteddfods are a great opportunity for students to improve their dance technique, confidence and performance skills as well as meet new people and have fun in a friendly environment. Personally, I have been heavily involved with eisteddfods from the ripe age of 3 years and performed in Solos, Duos, Trios and Groups. I still to this day cherish every moment on the stage, and the thrills and excitement that comes with being a performer. Skills learnt in eisteddfods team go far beyond dance. Participation and commitment to the performance team will promote the skills of motivation, time management, self-discipline and team work which will benefit your child in his or her future – whichever career path they choose. Feedback from current performance team students show improvements in school work because of a new found willingness to give everything a go and increased level of confidence and motivation within the school environment. I also found eisteddfods and performance teams allowed me to make friends for life with a sense of belonging and commitment. For many performers, their years performing were among the most vibrant and fun times of their lives and I am no exception. Although the eisteddfods being run in a competitive manner, the emphasis is on participating with a high standard of dance and performing with your heart rather than the competiveness of the sections entered. I hope that most of you will give your child the chance to perform and benefit from being part of the 2019 performance team. Compulsory VENUE REHEARSAL – Monday 29th April 2019 4pm – 9pm @ Ipswich Civic Centre, Nicholas St, Ipswich. Ipswich Combined Teachers Dance Festival – Dates: Friday 3rd May 2019 – Monday 6th May 2019 @ Ipswich Civic Centre, Nicholas St, Ipswich. Ipswich Junior Eisteddfod – Thursday 6th June 2019 – Sunday 16th June 2019 @ Ipswich Civic Centre, Nicholas St, Ipswich. 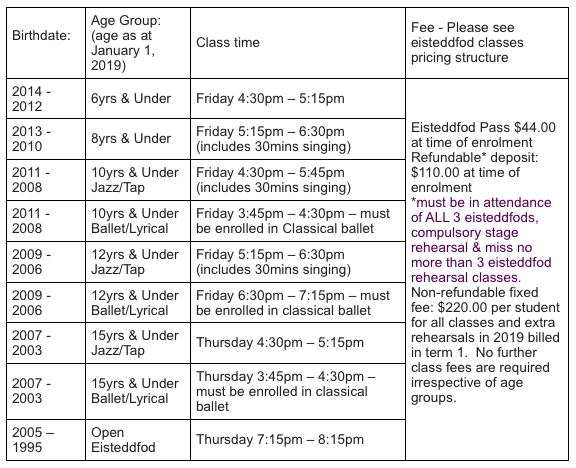 * Students who are unable to attend any eisteddfod OR our compulsory Venue Rehearsal will forfeit their eisteddfod deposit. All students require a uniform to wear to and from eisteddfods. This includes a SSDC jacket, SSDC polo shirt and own choice of SSDC tights or shorts. Bags may be purchased in addition to this but are not compulsory. Students will also need to purchase costuming for the routines they are selected to perform in along with shoes, tights, hairpieces etc. Costuming is usually available second-hand if the routine has previously been performed. All new routines will require new costumes. All students will also be required to purchase a once off $44.00 eisteddfod/extra rehearsal/venue pass. $110.00 deposit will be charged at the commencement of the year to show your commitment, which will be refunded if upon completion of all three competition and absence from no more than 3 classes (unless medically certified). In 2010, students of the SSDC performance team travelled to the United States of America to perform at various locations such as Disneyland and Universal Studios and participated in classes at the well-known ‘Edge Performing Arts Center’. This tour was an all round success with plenty of great feedback from all. Congratulations to all students! In 2012, SSDC students performed in Hong Kong Disneyland and in 2018 students performed on the Royal Caribbean Cruise, Explorer of the Sea.